Queretaro Mexico - Servilamina Summit Mexicana S.A. de C.V., a prime carbon steel coil and sheet distributor and coil processor has installed a high-strength Braner/Loopco Single-Loop Turret Head™ Coil Slitting and Slit Coil Packaging Line in their Queretaro, Mexico, coil processing facility approximately 100 miles northwest of Mexico City. 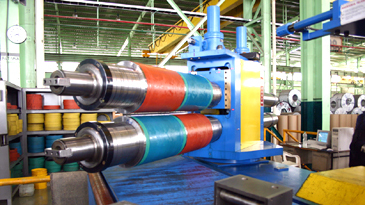 The new Slitting Line is capable of processing 25 ton x 60" wide 114,000 PSI tensile strength hot rolled, pickled, cold rolled, and galvanized coils in gauges from .024" through 1/4", at line speeds to 1,000 FPM. The Slitting Line is equipped with Entry and Exit 4-Arms, Entry and Exit Crop Shears, a 200 HP Turret Head™ Slitter equipped with two quick-change 10" slitter heads, heavy-gauge strip tensioning equipment, and a 250 HP x two-ratio Recoiler with patented "no-bolt" 20"/24" Speed-Load Recoiler Fillers, which allow Servilamina Summit to change from 20" to 24" ID coil production in one minute. The Slit Coil Packaging Line straps and packages 1" to 24" wide slit coils, weighing up to 10,000#, in a quick and efficient manner. 25 ton x 60" x 1/4" Single Loop Turret Head™ Slitting Line. Notice the entire slitting line is within clear view from the main operator station. Compact Line: Employing the Braner/Loopco compact line design, the Servilamina Summit Slitting Line occupies less than 45' from Uncoiler to Recoiler. 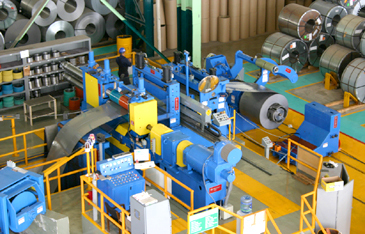 The unique Slitting Line arrangement conserves floor space, allows extremely fast coil threading, improves personnel safety and productivity by positioning all line components from entry end to exit end within the operator's sight lines, and eliminates the need for cameras and TV monitors. 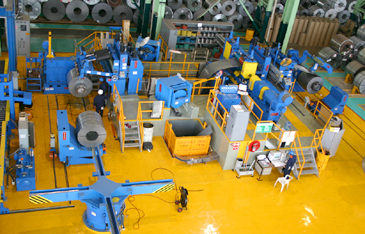 The compact Slitting Line employs the modern "hi-pass line" equipment arrangement that positions the strip-processing equipment above the coil OD in order to eliminate "reverse-bending", as the strip is threaded and processed. Compact hi-pass line benefits include faster coil threading; elimination of equipment-induced coil-breaks; elimination of strip surface damage from entry and exit pass line rolls; produces straighter sidewall slit coils; and generates tonnage unmatched by any other slitting line. Turret Head™ Slitter: A 10" arbor x 200 HP two (2) head quick-change Turret Head™ Slitter produces precise width tolerance slit strips with minimum burr throughout the entire range of gauges and mechanical properties. The Slitter arbors are mounted in precision machine tool bearings installed in massive one-piece stress-relieved and precision ground solid steel block arbor bearing housings that weigh nearly a ton each. Entry end view shows compact Uncoiler to Slitter spacing. The rotatable Turret housing is supported on a 300,000# capacity anti-friction bearing, and the hydraulic cylinder positioned outboard arbor bearing housing is mounted on zero-maintenance anti-friction precision machine tool slides. Huge aluminum-bronze gibs contain the vertically adjustable upper arbor bearing boxes and allow for "zero" axial arbor movement. Huge upper arbor bearing boxes are positioned by motorized anti-backlash screw jacks equipped with electronic encoder digital position readouts for quick and precise positioning. The unique Turret Head™ Slitter design allows re-tooling and head changes to be accomplished faster than with any other slitter design. The Servilamina Turret Head™ Slitter is designed so that a 3rd Slitter head can be easily added in the future. Completely exposed and accessible arbors cut re-tooling time and strain. No housings or bases obstruct the removal or installation of the slitter tooling. Heads are exchanged in less than 2 minutes.